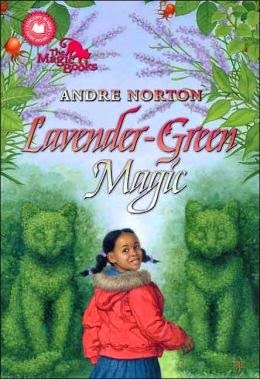 This week's time travel book is an oldie-- Lavender-Green Magic, by Andre Norton (1974, also published in paperback in 2006; that's the cover shown below right). It's the story of three kids who are left to stay in Massachusetts with grandparents they've never met when their dad goes missing in Vietnam and their mother has to go to work full time. Holly, the oldest of the three, is filled with doubt. The grandparents make a living from the town dump, piecing together and mending and salvaging what is discarded, and she's old enough to find this horrifying, but not so old as to appreciate it; the twins, Judy and Crockett, are young enough to be fascinated....And Holly is also worried about being black kids in a white school. She keeps herself to herself, and tries to keep Judy safe/isolated too. And of course all three miss their mom something fierce. And indeed, Holly seems to be overtaken by angry, hurtful thoughts. She's the next to lead the kids through the maze, but she takes them to a different woman--Tamar's sister, Hagar. Who's not a nice sort of witch wise woman at all. Holly's choices almost bring disaster to the family....and also to Tamar, when she's suspected of having used her powers in a dark witchy way and a mob of Puritans comes for her. But all works out well. Especially happily, for those of us who like gardening, the maze proves to be the key that will save the land by the dump from being sold, and the grandparents from being evicted. Past and present are nicely twisted, although there isn't a whole heck of a lot of nuance to Tamar and Hagar, and there's not a jot of explanation about their powers (which are indeed real and magical). These things have to be taken on faith. Don't be reading this one for a tremendously accurate account of the Puritans, because it isn't. 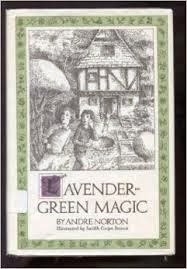 Do be reading it for the herb-lore, and the descriptive pleasures of finding of old things amongst the junk. And it is rare and pleasing to see a family of African-American kids at the center of an old and lovely/scary magical adventure. I would have loved it as a child, and didn't mind at all reading it as a grown-up even though I wanted to shake Holly quite often, which is tiring when you want to be reading for comfort. And I could have done without the grandmother's dialecitcal English of "laws"-es and apostrophies (jus', etc.). Long, long paragraphs of this, that I worry would be off-putting to the young reader of today. And I wish we'd had a chance to see Holly opening to the possibility of friendships at school. Oh well. Apart from the grandmother's truly jarring turns of phrase, I thought Norton did a reasonable job with issues of race, making it neither too much or too little of the story. One thing (a pedantic sort of thing) that I think Norton messed up on is Hagar's name. I was online today, reading up on Tamar and Hagar, both very interesting Old Testament women. Hagar was enslaved, raped, cast out with her son into the wilderness...but seen and saved by God, and centuries later her story resonated deeply with many African-American women (you can read more here; scroll down). Once you know this, it's a bit of a jarring note to have Hagar be the villainous one in a story starring African-American kids. (And nothing to do with this book, but this bit of research led me on to a lovely book from 1888 called Curiosities of Puritan Nomenclature, which is free online here and very diverting and worth sharing). LOOK. AT. THAT. COVER!!!!!!! Whoa. Holy Update. That being said... member of AfAm community, not feeling like I have to be besties with Hagar. Just sayin'. Never even heard of her being raped, as it was common for people of that era to take multiple wives - though, as a servant, I'm sure it's not like she was necessarily dated. In any event, I think we can let Andre name her villain whatever. My mother just pointed out that Hagar's story (what with her being Sarah's "handmaiden") was probably what gave Margaret Atwood her title, which hadn't occurred to me either. The new cover is nice! I loved the topiary/maze/garden aspect of this one, but I really struggled with the dialect, both the grandmother's and the Puritans', actually. And now that I know, I also wish Hagar had had a different name! That's an interesting note on the names. O, Time Slip Guru: Have you ever read Mazer's Saturday, the 12th of October ? Lizzie Skurnick Books has reprinted it, so I checked to see if you had reviewed it, to now avail. Livania wanted to know why it was so weird, and I just remember that even though I love time travel, I thought it was odd. Maybe something to add to your list. I may have to look for a copy of the Norton title. I have not read it! But the RI library system still has it, and I shall request it! The blurb sounds weird all by itself: "After spending almost a year with cave people from an earlier time, a young girl is transported back to the present greatly changed, both by her experience and by the fact that no one believes her."